Learn Slide Guitar is the ultimate DVD instructional guide to playing slide guitar like a pro. Designed for beginning-to-intermediate players, this DVD contains more than two hours of lessons that will teach you how to play in open and standard tunings, slide scales for soloing in all keys, improvising, open-tuning chord forms, muting, vibrato, Delta and electric blues, plus much more! Instructor, Andy Aledort, is one of the best guitar players around, especially when it comes to electric and slide. So many of these instructional videos are simply so basic, that you have to fast forward through most of the material to get to the ‘meat’ of the subject. Not with this one, though! 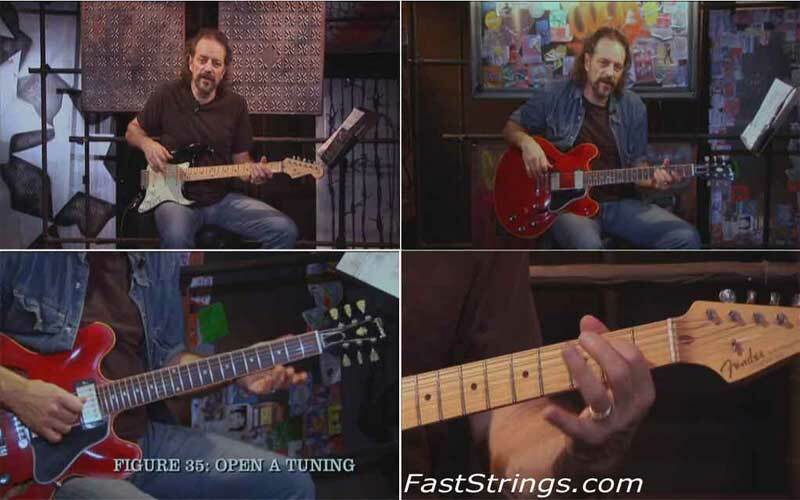 Andy takes you through all the major slide tunings, from open E, D, A and G. He finishes with slide instruction in standard tuning (the most challenging). He gives a little background history of each tuning and names some famous players who use them. Andy then demonstrates examples of the various players/styles, followed by a breakdown of each example. Very awesome presentation with many achievable technique development and practice opportunities. Andy Aledort is extremely laid back in his teaching approach but is quite thorough. The pdf down-able tab is easy to follow with minimal inconsistencies. Good stuff for beginner to intermediate slide players. Wearing the Slide: What Finger?